Addis Ababa-based Ethiopian Airlines is launching three-times-weekly service to Goma on July 10, offering one-stop service to the city via Entebbe in Uganda, one of six countries which lies next to the DRC’s long eastern border. 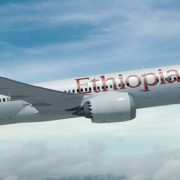 Boeing has announced at the Paris Air Show on June 17 that Ethiopian Airlines is the previously undisclosed customer for six 787-8 Dreamliners. Ethiopian Airlines’ six new Dreamliners will complement the 13 Boeing 787-8s the Addis Ababa-based carrier is already operating. Ethiopian Airlines has revealed itself as the customer for a firm order for 20 Boeing 737 MAX 8s, the carrier also securing options and purchase rights for 15 more 737 MAX 8 jets. Lessor Palma Holding Limited has signed a letter of intent to order up to eight two-class Bombardier Q400 NextGen aircraft. 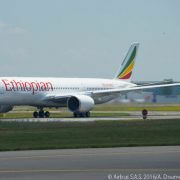 The agreement, announced at the Dubai Airshow 2013, would cover four firm-ordered aircraft and four options. Ethiopian Airlines will launch four-times-weekly scheduled service between its hub at Addis Ababa and Seoul’s Incheon International Airport in the Republic of South Korea on June 18. Ethiopian Airlines, which claims to be the fastest-growing airline in Africa, is launching service to Blantyre in Malawi and Ndola in Zambia on March 31. 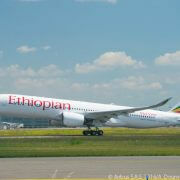 Ethiopian Airlines will begin operating its twice-weekly Addis Ababa-Toronto service with Boeing 787 Dreamliners on November 9. Based on customer feedback, Ethiopian Airlines asked the manufacturer to reconfigure the airline’s latest Bombardier Q400 NextGen deliveries and as a result Ethiopian is the first carrier to take delivery of a Q400 NextGen with the reconfigured cabin.